SALT LAKE CITY--(BUSINESS WIRE)--Salt Lake Comic Con (http://saltlakecomiccon.com/) took a page out of its next guest’s book and never gave up. 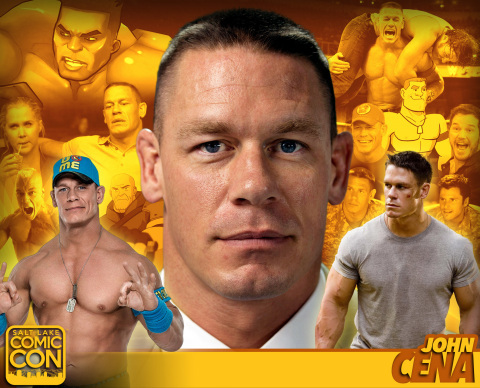 As a result, John Cena, the face of the WWE, will be at Salt Lake Comic Con 2016. Cena is a WWE Superstar, actor, rapper and reality TV show host. Cena joined the WWE in 2001 and has since become the face of the organization. During his career he has won 24 championships and transcended the industry to become a global icon. Cena’s movie career includes The Marine, 12 Rounds, Legendary and Trainwreck.. He’s an accomplished musician. His debut album, You Can’t See Me was released in March 2005 by Columbia Records and he has performed five WWE theme songs. Cena’s also involved in a number of charities, including the Make–A-Wish Foundation, granting more than 500 wishes for kids with life threatening illnesses; the most wishes granted in history. Cena is a pop culture fan himself, specifically Japanese anime and lists his favorite anime movie as Fist of the North Star. He’s also a video game fan, particularly the Command & Conquer series. Salt Lake Comic Con 2016 is less than 30 days away and promises to be another epic event. In addition to Cena, some of the other celebrity, artist and author guests include William Shatner, Michael Rooker, Lou Ferrigno, Billy Boyd, Lennie James, Seth Gilliam, Liam McIntyre, Tom Wopat, John Schneider and Catherine Bach, Emma Caulfield, Jim Beaver, Paul Wesley and Ian Somerhalder, Chad Hardin, Bill Galvan, Elizabeth Breitweiser, Aaron Lee Yeager, Ally Carter and Aaron Michael Ritchey. Click here for a complete list of celebrity, artist and author attendees. Salt Lake Comic Con 2016 is September 1-3, 2016 at the Salt Palace Convention Center. For more information about Salt Lake Comic Con 2016 or to buy your ticket(s) now, visit http://www.saltlakecomiccon.com/. Salt Lake Comic Con is organized by Dan Farr Productions, in partnership with ABC4/CW30 of the Nexstar Broadcasting Group and was founded by Dan Farr and Bryan Brandenburg. Dan Farr Productions is an event and marketing group devoted to organizing events, launching and acquiring new shows, and partnering with premium celebrities and brands in the pop culture arena. Dan Farr Productions is dedicated to producing spectacular celebrations of popular culture that lead the market in providing exceptional and rewarding experiences for our consumers, fans, celebrity guests, vendors and partners. Find out more at: www.SaltLakeComicCon.com, www.abc4.com.